This page has sponsorship info for tournaments. See also: Club Sponsorships. 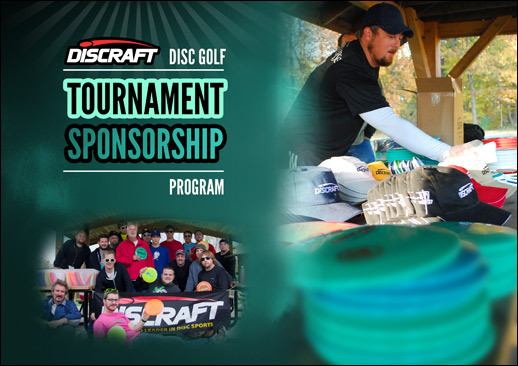 Tournaments help disc golf to grow, and Discraft supports you! Rock bottom pricing: better than wholesale! Exclusive access to Ti Challenger fundraisers available only to tournaments! Earn D-Dollar Rewards with every order, no minimum! $10 per player gets you an instant player pack valued at $34, so you'll have happy players and have time to focus on other things. How Does Tournament Sponsorship Work? 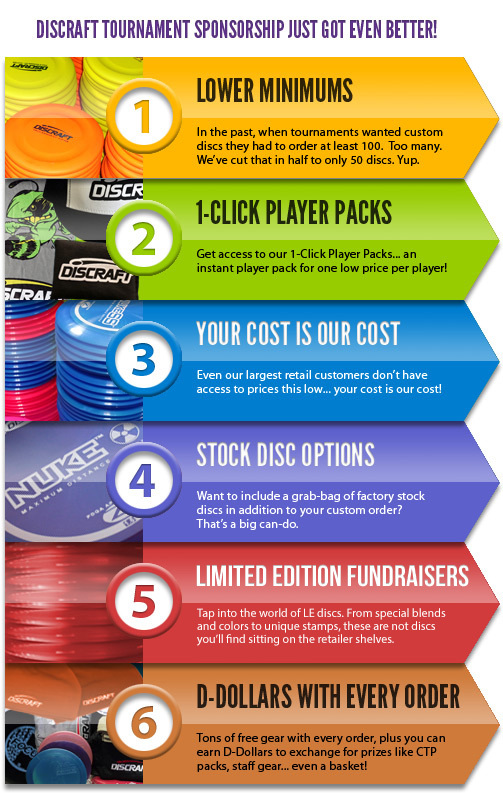 You order at least 50 custom tournament discs with your tournament art and date on them for a super low cost. You can raise funds by selling them at retail prices, or give them out in your player pack. 1-click player packs: easy and instant player packs that will bring in tons of players. D-Dollar Rewards. Choose from tons of packages that you can use to promote your event, or as giveaways. 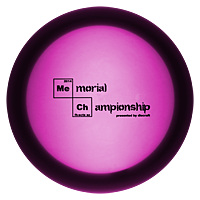 Exclusive access to fundraiser discs: Ti Challenger and all CryZtal models! No set-up fees on your custom order! Banner, stickers and pencils... all free for the asking! Two hats and two staff shirts, no charge man! 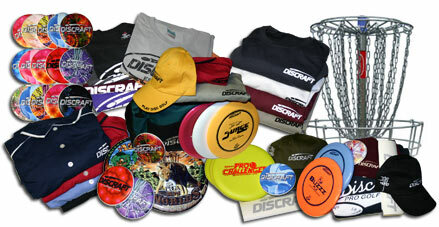 Display of Discraft banner at event. Any other benefit your event provides to primary sponsors. Need art help? We have some free design templates that we're happy to add your tournament info to. If you have your design but need help converting it to conform to our art specs, the Discraft Art Department can assist for free or a nominal fee depending on your needs. 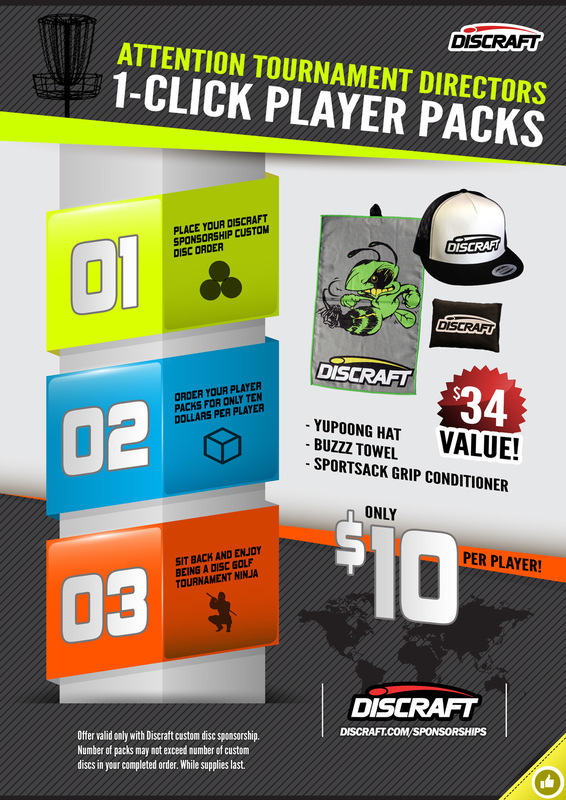 With Discraft tournament sponsorship you can triple your funds lightning fast. If you merchandise your $7.00 ESP Crank at the suggested retail price of $17.99, that one sale generates $10.99 of profit for your tournament! It will add up quickly. PDGA sanctioning is not required to be eligible, but your tournament name and event date must be included in your artwork. Plus D-Dollar Rewards can add to your swag: Now EVERY tournament sponsorship includes D-Dollars that you can cash in for free CTPs and other prizes... even a basket to use for additional fundraising. See details below. We'll also waive your die and set-up charges to save you another $60. You will also get (on request): 2 TD staff shirts and hats, a large Discraft event banner, 50 stickers and a box of 144 pencils... in addition to whatever you choose to spend your D-Dollars on. Our tournament sponsorship packages apply only to custom printed tournament golf discs. Minimum order: 50 pieces minimum with a 10-piece minimum per model. Your art work must include the tournament date and name to be eligible. All pricing and products subject to change without notice. 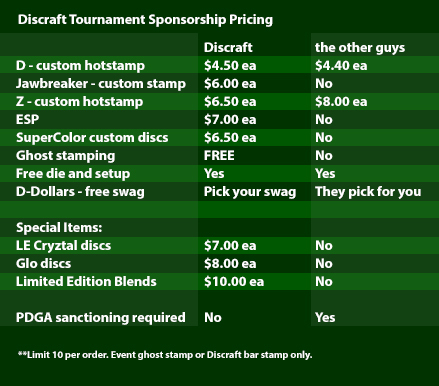 The table below shows the extra D-Dollars you will receive towards sponsorship based on your total tournament sponsorship custom golf disc purchase. You can spend those D-Dollars on a wide assortment of packages or individual items from the D-Dollar Store. Remember: to be eligible, your tournament name and date must be on the disc.